Listening to music in the outdoors is nothing new. There are marine speakers for boats and portable speakers for hiking and camping. What is new are pool speakers. With the best pool speakers, you can even enjoy your music in the swimming pool. A top rated floating pool speaker can be used safely in the water, while still delivering powerful and clear audio. A floating speaker will be resistant to water damage and some designs can literally float beside you in the water. While a waterproof pool speaker isn’t the loudest of designs, it will still deliver enough punch that you can get the party started, but it can be difficult finding a high-quality design. Our guide will help you find the best floating pool speaker, so that you can dive in and jam to the tunes. 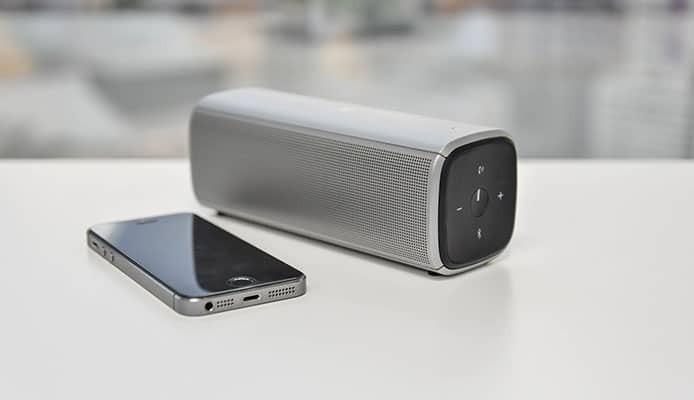 This speaker will wirelessly connect with up to 3 smartphones or tablets, so that everyone can take turns playing their music. It has a powerful stereo sound that also allows you to take calls from your speaker at the touch of a button. All sound is crystal clear. It has a built-in rechargeable Li-ion battery that has a 20-hour battery life. It charges using a USB cable. 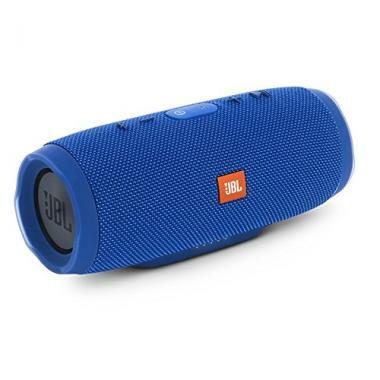 You can also connect this speaker to other JBL Connect enabled speaker to create your own ecosystem. For a waterproof rating of IPX7, these speakers are strong protected, which means they are also resistant to dust. They also have a rugged exterior for ultimate impact resistance. It has enhanced bass and loud volume with a 10-watt subwoofer. It uses Bluetooth 4.0 to connect wireless to any capable device. The audio is crystal clear, and it consumes less energy. It also has an LED display with 5 color modes to make it fun. The Beach Bomb Waterproof Speaker has a rating of IP66. It is so watertight that it will float on top of the water and can handle being submerged up to 3 feet underwater. It is completely splash proof and rain proof.It has a built-in mic which offers you hands-free convenience when using your cell phone. It has direct music control buttons to adjust the volume and change the music. It also has an aux in jack and a 3.5mm USB cable.It is portable and reliable for many different outdoor activities. It is compatible with all devices and allows you to have music all around you. 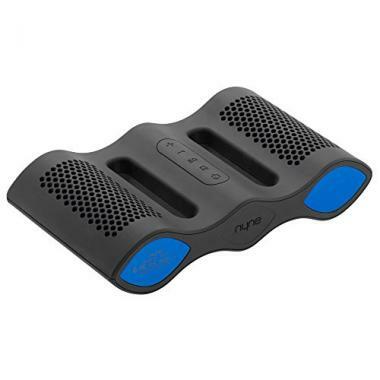 The Surf Touch Speakers float in water and have a waterproof IPX7 rating. They can be immersed in water up to 3 feet deep for 30 minutes. The waterproof rating also makes them resistant to dust, mud, rain, and shock. They have superior sound with an advanced 16-watt digital sound. They have noise and wind reduction to ensure crystal clear sound. They are easy to use and portable. A convenient touch panel allows you to control the volume with just a tap. A full charge will last about 3 hours, but they can last up to 8 hours at 50% volume. They use a micro USB cable to charge and have Bluetooth connectivity. If you are looking for advanced technology, look no further. Maze Exclusive’s design has rechargeable Lithium-ion batteries, so that one charge will last you 15 hours. The speaker has an IPX7 rating, which makes it fully waterproof and ensures it floats. Maze Exclusive’s design is simply the best out there with more power and more energy. 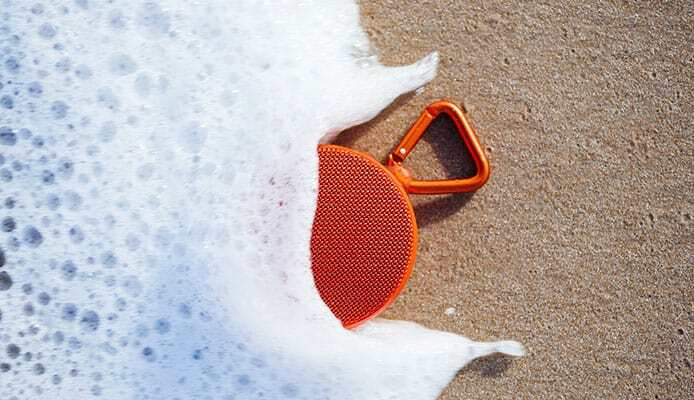 The Aqua Floating Bluetooth Speaker is water, dust, and shock resistant with a waterproof IPX7 rating. It can be submerged 3 feet underwater. It has a great stereo sound with 2 drivers and 2 passive radiators and 4 EQ settings. Bluetooth 3.0 allows you to wirelessly connect and stream your music. A 3.5mm Aux input can be used as a backup or to connect to MP3 players. It also has a waterproof microphone for hands free calling. It has a rechargeable battery using a USB cable and one charge has a 10-hour playtime. It also includes a hanging/carrying strap. Monster holds true to their name and offers a speaker with 7 hours playback. It charges using a USB cable and USB power adapter. It can connect to any device using a 3.5mm Aux cord. It has a rechargeable Lithium ion battery. The speaker also has a tough silicone case. 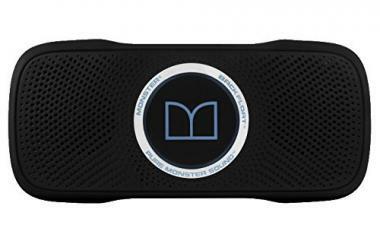 The Aqua Blast Pool Speaker has built-in Bluetooth for wireless music streaming. It works with all Bluetooth devices. It has a waterproof marine grade construction to ensure it floats. A rechargeable battery gives 4 hours of playtime. 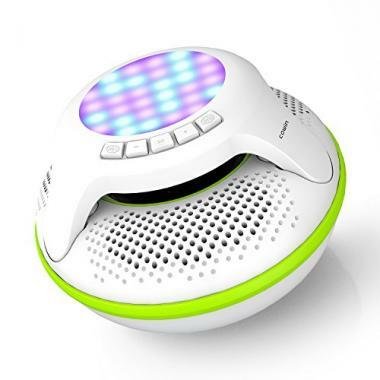 It is a full range speaker with stereo sound and has LED indicator lights. When it comes to choosing pool speakers, you want the best. A top rated floating pool speaker should be durable, waterproof, and have clear sound. They should won’t be as loud as large speakers, but they also shouldn’t be quiet like shower speakers. It can be hard determining what makes a quality floating speaker, but a few different features can make certain designs stand out. 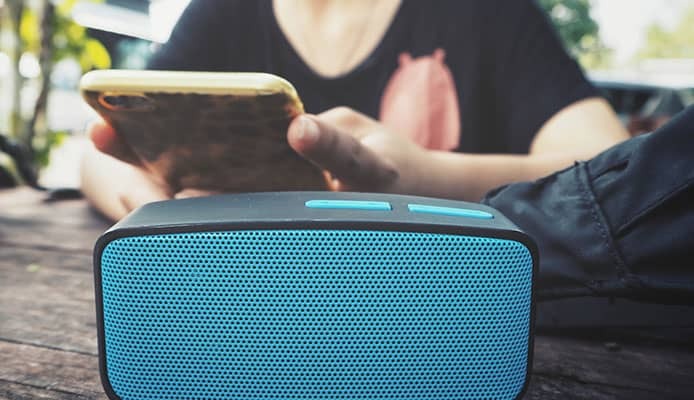 If you take into consideration features like durability, portability, and battery life, you’ll be more likely to find a waterproof floating speaker that is high-quality and suits your needs. There are a lot of different speaker designs and not all of them may have the same features. Some designs are sleek and modern, while others are whimsical and fun. You may also encounter special features like colorful lights to make the speaker more attractive for parties. The design and features of the waterproof pool speaker that you choose will likely be determined by your own personal preference. 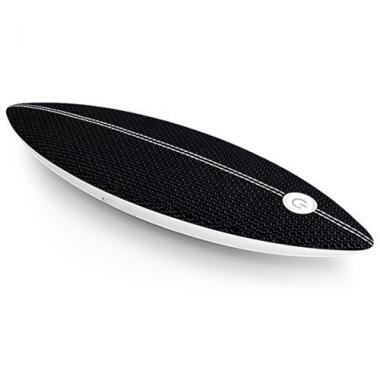 You can use pool speaker reviews to help you determine if the design and features enhance the floating speaker. It is important to understand the difference between water resistant vs. waterproof. The two terms do not equate to the same level of protection against water. 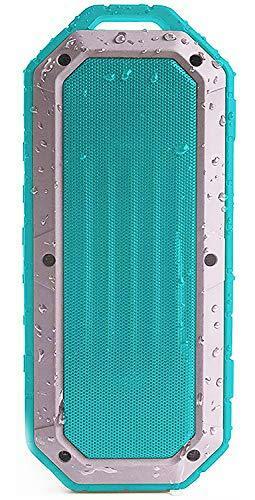 A water resistant Bluetooth pool speaker would be protected against accidental splashes or a few drops of water. It would not be able to be submerged in water. A waterproof pool speaker would be fully resistant to water. This means that it may be a floating waterproof Bluetooth speaker and it can be placed directly in the pool water, without being damaged. If you are looking to be using your pool speakers a lot or you want to listen to music while you’re relaxing in your pool floats, a waterproof floating speaker would be the best choice for you. However, keep in mind that the price will change between water resistant and waterproof. Usually, waterproof is more expensive. A Bluetooth pool speaker should be durable. Whether it is a waterproof pool speaker or has splash resistance, the best design will still be durable to be long-lasting. A durable floating speaker will be made of quality materials that ensure it can be used in rugged conditions throughout the years. The best pool speakers will be made of materials like plastic and rubber. They should be resistant to accidental drops, as well as dust, dirt, and other debris. Durability is very important because it can determine if the pool speakers are worth the investment. The sound quality will likely be affected by the watts that power the speaker. The more watts the speaker uses, generally, the louder it will be. Often a top rated floating pool speaker that has great audio/sound quality will be more expensive, but worth the investment. The more you spend, the better audio/sound quality the speaker will have. This will also allow for the sounds to be loud and clear. So, it is important that you determine your budget and what level of audio/sound quality you want or need. The connectivity of pool speakers is determined by how the speakers connect to your device to play the music. 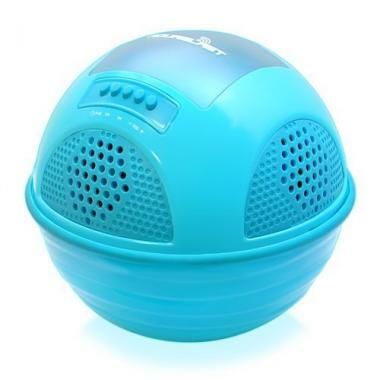 A floating Bluetooth speaker for pool times is the best choice because it allows you to wirelessly connect your device. The connection will be strong and clear, which also ensures great audio/sound quality. The best pool speakers can connect to any Bluetooth capable device like phones, tablets, waterproof MP3 players, and computers. However, if you want to manually connect to your speaker, it may have the option to use an AUX cord or audio jack cable. These are less common ways for speakers to be connected nowadays, but it can be useful as a backup connectivity method. The best pool speakers will be portable. They should be small enough to be carried in purses and backpacks, as well as durable enough to handle the bumps of traveling. The best pool speakers can be used in any location, even beyond the pool too. Every speaker will need to be charged, but not all speakers will have the same run time off of one charge. There are speakers that have an 8 hour battery life and others that can last up to 30 hours. In general, the better the battery life is the more expensive the pool speakers will be. Most floating speakers will have some kind of manual control on the speaker body. You should be able to change the volume and skip songs. This will allow you to avoid any frustrations with controlling your music. Q: What are outdoor floating pool speakers and why use them? A: Floating pool speakers are a device that you use to listen to music. Instead of having personal music and listening using waterproof headphones, pool speakers will allow you to share the music for everyone to hear. If you are wanting to listen to music with friends inside the pool or are resting under pool umbrellas, a top rated floating pool speaker can get the party started. They are a better choice than other speakers because their design will be specifically safe for use around or in the water. Q: Is the speaker going to float or sink? A: This will depend on the model of the pool speaker. Some designs do float, and others are not suitable to be used in the water and will sink. You should check the brand and model specifics before you make a purchase. It will be indicated how the speaker can be used and from there, you can determine if it will suit your needs. Q: Are floating speakers safe to use? A: Yes. Floating speakers are designed to be used either in or around pools. They are designed to be safe to use around water and should never cause any injury. They should be made from materials that are also safe to use with pool chemicals. When it comes to having a party, music can be essential to a fun and lively atmosphere. When you want to take your party to the pool, the water shouldn’t stop you. The best pool speakers are designed to be used in and around the pool, so everyone can dive in and splash to the tunes. There are a lot of different designs, but if you know exactly what you want or need, you can save time and money. 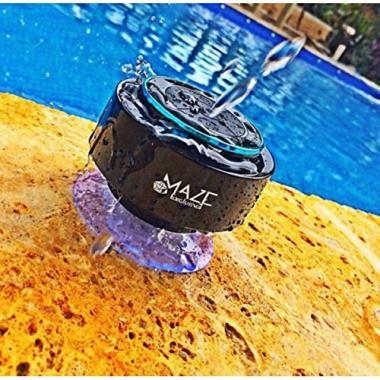 A top rated floating pool speaker will have you relaxing and having fun all summer long. Do you own one a pool speaker that made it onto our list? Let us know how it has worked for your swimming pool audio needs in the comments section below.